In mid-March, Governor Mike DeWine introduced the details of his first state budget, after previewing several initiatives in the weeks before the budget’s announcement. Overall, the 2020-2021 budget is framed as an investment in Ohio’s future. DeWine stated that “for too long, we’ve tinkered at the margins” and stated his administration is dedicated to making significant investments in programs and systems where improved outcomes may take years to achieve. In this edition of State Budgeting Matters, The Center for Community Solutions has examined the budgets of key health and human services agencies including the Ohio Departments of Health, Job and Family Services, Medicaid, Developmental Disabilities, Mental Health and Addiction Services and Aging, which contain many of the key initiatives of the DeWine administration. Source: LSC Redbook Analysis of the Executive Budget Proposal, ODH. The headlining investments in the Ohio Department of Health’s (ODH) budget center on expanded home visiting, lead abatement activities and increasing the legal age of tobacco purchase from 18 to 21. ODH is responsible for a wide breadth of issues within its agency from direct service to regulatory duties to programs coordinated through grants to outside entities. The agency’s overarching goal is “preventing disease, promoting good health and assuring access to quality health care.” The 2020-2021 executive budget proposes to do this through a variety of initiatives with the largest percentage increases in funding for Help Me Grow (home visiting) and chronic disease, injury prevention and drug overdose. The Governor’s Advisory Committee on Home Visitation proposed 20 recommendations leading up to the budget’s introduction. It is anticipated that these recommendations will inform the rollout of the proposed expansion of the program. The goal of the program is to improve outcomes for both children and parents, by taking a two-generation approach. The budget also requires the ODH director work with the Tax Commissioner (Ohio Department of Taxation) to develop a tax credit program for lead abatement. Individuals seeking lead abatement for eligible properties can receive a tax credit up to $10,000. The ODH director is authorized to issue a total of $5 million in tax credits per biennium. While no money is attached, three committees that review different types of deaths are created in this budget language. The budget allows for the establishment of the drug overdose fatality review committee, the fetal-infant mortality review committee and the pregnancy-associated mortality review committee. The drug overdose fatality review and fetal-infant mortality review committees can be created at a local level (city or county), while the pregnancy-associated mortality review committee (which exists already, but is not defined by statute) sits within ODH. The language is permissive as to the formal establishment of these committees, but if the committees are established there are many elements included related to the process that these committees must adhere to. Codifying the pregnancy-associated mortality review committee has been a Community Solutions priority over the last year, as there has not been consistent data reporting on maternal deaths in Ohio. Funding in the chronic disease, injury prevention and drug overdose line-item targets prevention and reduction of obesity, chronic diseases, tobacco use and drug overdoses. This line-item was funded at about $3.5 million in FY2019 and increases to proposed funding of $7.7 million in 2020 and $7.9 million in 2021. Some of the increase in this line is allocated to initiatives described in the section examining investments in Ohio Department of Mental Health and Addiction Services (ODMHAS) and RecoveryOhio. The DeWine administration proposes to increase the legal age for purchasing tobacco products, including vapor, from age 18 to 21. Legislative language changes the legal age associated with tobacco use from age 18 to 21 throughout the Ohio Revised Code. While this is a key initiative for ODH, there is no increase in funding for enforcement of these changes. Source: LSC Redbook Analysis of the Executive Budget Proposal, ODJFS. The ODJFS budget proposes to increase the line-item (600523) that supports local child welfare agencies from $77.3 million in FY2019 to $151.1 million in FY2020 and in FY2021. This is a nearly 96 percent increase in funding for this system. The budget language designates up to $25 million per fiscal year for providing services to children in the custody of child welfare agencies and to provide services to youth at-risk of entering the child welfare system. This designation encompasses multi-system youth, described below. Additionally, up to $10 million per year in the 600523 line will be used for incentive payments to child welfare agencies based on performance outcomes that are tied to “ensuring the safety and timely permanency of children.” The remaining funds in this line-item are distributed to local child welfare agencies and includes a specific allocation to recruit foster families. Additionally, up to $10 million per year in the 600523 line will be used for incentive payments to child welfare agencies based on performance outcomes that are tied to “ensuring the safety and timely permanency of children. The overall goal of the legislative committee was to understand the issues these children and their families face and how to address them holistically, with a focus on preventing children and young people from being removed from their families or custody relinquishment in cases where the family has no other means to pay for treatment services for their child’s multiple needs. The committee made recommendations after seven public hearings. These recommendations were released publicly in June, 2016. While none of the recommendations from this report are formally integrated into the administration’s budget proposal, $25 million in each fiscal year was identified in the ODJFS budget to provide services for children in the custody of child welfare agencies and for children at-risk of entering the custody of child welfare. There are also line-items dedicated to multi-system youth in both the Departments of Medicaid’s and the Department of Developmental Disabilities’ budget. This issue has been discussed during budget testimony before the House Finance Committee and subcommittee on Health and Human Services. Parts of the Joint Committee’s recommendations may be integrated into the House’s version of the budget and there is the prospect of dedicating a funding stream to MSY. The TANF program is jointly funded by the federal and state governments and supports low-income Ohio families through cash assistance, work supports, child care and efforts to help families avoid financial emergencies. Last year, Community Solutions examined the TANF program in Ohio and identified significant, chronic underspending of federal dollars. In the proposed 2020-21 budget plan for TANF spending, called the TANF Services Framework, the underspending, or “TANF sustainability fund balance” was $596 million in FY 2018 and is estimated to be $545.5 million by the end of FY 2019 (June 30, 2019). While balances of $385.1 million and $184.8 million are projected in the TANF sustainability fund for 2020 and 2021, respectively, this fund is projects to sit empty in FY 2022 indicating it will be fully spent by the end of FY 2022. According to the framework, this means that by FY 2023, there will be a reduction in the total TANF funding that goes toward publicly-funded child care. Increased federal funding for publicly-funded child care will be directed to increasing reimbursements for child care providers and preparing for the 2020 deadline that all children in publicly-funded care be enrolled in a setting that has achieved some level of quality rating. This budget frames this all as preparation for expanding eligibility for child care from 130 percent FPL to 150 percent FPL in future years. Federal funding increases from $306.3 million in FY 2019 to $331.2 million in FY 2020 and $332 million in FY 2021. There are no new state general revenue fund dollars dedicated to child care. According to data from 2017, there were 16,741 reports of neglect, exploitation and abuse across the state. Community Solutions is also paying close attention to Adult Protective Services (APS) According to data from 2017, there were 16,741 reports of neglect, exploitation and abuse across the state. For every case of abuse that occurs, however, it is estimated that 23 remain veiled. While APS are not in the budget of the Ohio Department of Aging (ODA), (it is located within ODJFS), it nonetheless has a large impact on seniors. As we have noted in previous reports, APS remains of critical importance, as it assists in addressing incidences of physical abuse or financial exploitation of seniors. Currently, Ohio funds APS at $2.74 million for FY2019, which when spread out across the state amounts to roughly $30,000 per county. Governor DeWine’s initial budget does not increase APS funding for FY2020 or FY2021. However, several lawmakers have discussed methods to increase APS funding from its current funding level, either through the state biennium budget or through standalone legislation. In the proposed biennial budget offered by the DeWine administration, the Ohio Department of Medicaid (ODM) set forth a proposal that attempts to realize the governor’s policy priorities with children and behavioral health. To do this, ODM has offered initiatives that build on the state’s earlier work in value-based reform, waivers which seek to fundamentally change behavioral health and the Medicaid expansion, as well as services focused on coordinating care for some of the most complex populations. In addition, ODM consciously put forward a proposal that meets its obligations to conform to the Joint Medicaid Oversight Committee’s (JMOC) target growth rate, requiring it to reconfigure or eliminate policies to meet the statutory constraint during a time of predicted reductions in federal funding for the Medicaid expansion and Children’s Health Insurance Program. According to the Legislative Service Commission, there are 23 distinct policy initiatives of ODM. All told, the initiatives net 1.81 percent of all funds associated with ODM’s budget at $923.1 million. This is accomplished through a series of enhancements and cutbacks, with significant resources allocated for hospitals, behavioral health and a number of efforts to improve maternal and infant health. Ohio has a poor track record in infant mortality outcomes, ranking 41st nationally. Ohio has a poor track record in infant mortality outcomes, ranking 41st nationally. This is dubiously apparent for African-American women and children who, as Community Solutions has documented, are at a higher risk. In ODM‘s budget, there are four initiatives which explicitly focus on expectant or recent mothers, and their children, totaling nearly $88 million dollars in investment of general revenue funds (GRF) with varying levels of direct state share. First, ODM allocates $47.1 million to home-visiting services. These services typically include screening, case management and other supports for families. Early in his administration, DeWine, under the leadership of Director of Children’s Initiatives LeeAnne Cornyn, convened experts in the maternal and children’s health field to deliberate and produce a report, including recommendations, on home visitation in Ohio. Of the 20 recommendations offered by the report, leveraging Medicaid as a financial resource was explicitly cited. The executive proposal includes more than $47 million to facilitate this effort. ODM allocates $47.1 million to home-visiting services. Beyond home visitation, the executive budget proposes more than $40 million to coordinate services for mothers during the early stages of pregnancy, stabilizing mother/child relationships as both grapple with the effects of opioid use disorder and an extension of the Medicaid eligibility period for higher income mothers, post-partum. In all cases, policy concepts are developed with an eye towards reducing infant mortality and improving maternal and infant outcomes. While Medicaid spending is diverse, a significant portion of payments are made to cover hospital services, nursing facility reimbursement and pharmaceuticals. In addition to the rates they are paid by the state or through managed care, hospitals receive supplemental payments to cover services for the underinsured and uninsured as well as compensate for the differences in reimbursement between Medicaid and Medicare payment rates. These programs are known as the Disproportionate Share (DSH) program (called the Hospital Care Assurance Program or HCAP in Ohio) and the Upper Payment Limit (UPL) program. While there are additional, specific supplemental payments for a limited number of public hospitals, these two programs apply to all hospitals statewide, and rely on a provider fee as a state match to draw down federal dollars. In regards to HCAP, there is a reduction of nearly $67.6 million between FY2109 (estimate) and FY2021. This reduction is due to federal law tied to the Patient Protection and Affordable Care Act (ACA) which scheduled reductions for these payments due to the increased coverage afforded via Medicaid expansion. While there have been recent delays in these cuts, and continued advocacy for additional delays, the budget contemplates these cuts will be enacted. UPL, conversely, will see a significant increase, averaging 15 percent over the biennium. This represents a difference of nearly $218 million between FY2019 and FY2021. This effort, which ODM describes as alignment, decreases financial pressure on state level general revenue to draw down additional federal funds. This initiative also represents the largest single policy initiative appropriation totaling more than $886.1 million over the biennium. Nursing facilities, on the other hand, are subject to the elimination of a payment program, with the removal of the nursing facility market basket update. As was highlighted by JMOC’s actuary, the market basket update, which guarantees rate increases without any specific criteria for quality or outcomes, represented a significant cost growth factor for the biennial budgetary cycle. As Director Maureen Corcoran noted in her testimony before the House Finance Subcommittee on Health and Human Services, when JMOC established its target inflationary rate for the executive budget as required by law, this left the department with a $270 million gap in funding. The market basket elimination helped close this gap, saving ODM nearly $240 million. While not a significant policy endeavor in terms of dollars, the pharmacy benefit continues to be an area of focus for both ODM and the members of the General Assembly. Over the last few years, the use of pharmacy benefit managers (PBMs) by Ohio’s Managed Care Organizations (MCOs) faced increased scrutiny from the General Assembly as members learned about the ways PBMs made money on the margins of spending for drugs in Medicaid. This lead to numerous hearings and an audit by Ohio’s then State Auditor Dave Yost (now Attorney General) who concluded the ways in which PBMs were establishing prices were excessive, that such practices may have led to additional closures of smaller, independently owned pharmacies, that data on fees was not transparent and that there may have been abusive practices affecting rebates, medical loss ratio calculations of MCOs and potential conflicts of interest. As a response, ODM required MCOs to use a “pass-through model” and is moving to a single formulary for all drugs. This means PBMs can only charge Medicaid the same price a pharmacy is paid and that pricing between MCOs is uniform. Additionally, ODM is conducting a review with the MCOs to analyze and make data about the pharmacy benefit transparent to better understand its cost construction. While it remains to be seen what this data effort may ultimately mean in terms of policy reform, the PBM issue is one element of the complicated supply chain associated with pharmaceuticals, and questions remain about systemic change. One of the primary obligations of ODM is to establish policies which simultaneously control costs while improving outcomes for target populations. According to recent research from the Health Policy Institute of Ohio (HPIO), Ohio’s current value is low relative to other states, coming in at number 46 out of the 50 states. Value, as HPIO expresses it, is population health contrasted with health care spending. According to the report there are a number of areas which contribute to this underperformance including the influence of the built environment, utilization patterns, chronic disease, income and fragmentation in behavioral health. Looking at some of the policy initiatives proposed by ODM, including waivers, there is some alignment between these deficiencies and the proposals offered. According to recent research from the Health Policy Institute of Ohio (HPIO), Ohio’s current value is low relative to other states, coming in at number 46 out of the 50 states. For children, $57 million will be invested to increase access to behavioral health in schools, support multi-system youth, increase lead testing and hazard control as well as reform Ohio’s Comprehensive Primary Care Initiative (CPC) to focus on kids. In schools, telehealth services will be deployed to address the behavioral health needs of students. National research suggests that these services are effective in decreasing the more acute utilizations of therapeutic services and admissions with anticipated outcomes such as a reduction of depression and violence. This tool also has the potential to decentralize the resource, allowing children to stay in school and providers to see more children. For children exposed to lead, Ohio will continue to develop the last biennial budget’s policy of leveraging federal dollars to remediate homes contaminated with lead. While these dollars will focus on intervention, the CPC program has the potential to increase Ohio’s current underperformance on a number of wellness metrics for children enrolled in managed care, including the number of kids who are screened for lead exposure per the requirements of Early and Periodic Screening, Diagnostic and Treatment (EPSDT). CPC, which is a primary care oriented program focused on population health management, incentivizes physicians to better manage patients. CPC does this by partnering with MCOs on common populations and collaborating to improve quality with a case management fee in addition to typical reimbursement rates. While the pediatric CPC program is likely going to be broader than lead testing and screening, it has the potential to target quality improvement efforts on children vulnerable to exposure and to improve Ohio’s performance on this measure. Better screening data can then supplement other efforts by the state and local governments to allocate resources where they are most needed in a more timely fashion. Notably, the state is moving forward with additional reforms to Ohio’s managed care program, allocating dollars to develop a more comprehensive approach to behavioral health in managed care and reprocure the contracts for the MCOs. In regards to behavioral health, the state is reconfiguring the benefit to a service called Behavioral Health Care Coordination (BHCC). This service, building on the recent efforts in Ohio’s behavioral health redesign, is meant to reconfigure the benefit administration for this population with a renewed focus on serious mental illness and children. This effort, which totals $338 million over the biennium, will be primarily funded through federal dollars. The work to define this benefit is ongoing and will be explored in future Community Solutions reports. The work to define this benefit is ongoing and will be explored in future Community Solutions reports. In regards to procurement, ODM will allocate $7 million over the biennium to do the work necessary to effectuate contracts with MCOs. In her testimony before the Ohio House Finance Subcommittee, Medicaid Director Corcoran highlighted several activities associated with procurement, including in-person listening sessions and regional meetings for feedback, a robust request for information and a request for application process bidding, completion of a systematic readiness review for each MCO and a transition plan. Given the role MCOs play in overseeing the benefits of 9 in 10 Medicaid recipients, there has been much stakeholder interest, both in and outside of the statehouse, in how these contracts are effectuated. With that said, the contracting process has not interrupted ODM’s efforts to leverage MCOs to enact value-based payments and increase the amount of MCO capitation held back, known as “withhold,” unless certain quality benchmarks are achieved. Lastly, Ohio has allocated additional resources to enact two 1115 demonstration waivers pursued by ODM totaling $35.5 million over the biennium. First, Ohio will finalize its application for a Substance Use Disorder (SUD) waiver that would enable payment for traditionally non-reimbursable inpatient behavioral health services. In addition to the SUD waiver, Ohio also received Centers for Medicare and Medicaid (CMS) approval for a Community Engagement waiver which is commonly known as a “work requirement” waiver focused on people enrolled through the Medicaid expansion. This waiver would require eligible individuals to either qualify for an exemption (such as being older than 50 years of age) or be engaged in some approved community engagement activity for up to 80 hours a month (employment or education). For both waivers, federal law dictates a robust planning process that documents beneficiary experiences and impacts which will be monitored over the life of the waivers. Neither waiver has a defined start date, though the community engagement waiver is set to begin in 2021. Governor John Kasich’s administration made ODM a standalone agency and this is the first budget under an administration other than Kasich’s. It builds on, eliminates and revises previous policy direction. First, from a general budgetary perspective, ODM consciously developed its budget with the JMOC limit in mind. While this was ostensibly adhered to by the previous administration, this budget was explicitly designed to accommodate that statutory obligation. Additionally, Ohio will see reductions in federal funding for both the Children’s Health Insurance Program (CHIP) and the Medicaid expansion. While the reductions are significant, they represent a small portion of the overall Medicaid budget and are final in terms of additional decreases, pending a change in law on the federal level through Congress. While the reductions are significant, they represent a small portion of the overall Medicaid budget and are final in terms of additional decreases, pending a change in law on the federal level through Congress. From a policy perspective, the initiatives offered align with the governor’s focus on children and behavioral health, with significant investments to align services and to finance local level activities to address pressing public health crises such as infant mortality, substance use and lead poisoning. Given the reliance on local networks to effectuate much of this work, ongoing data will be helpful in determining the effectiveness of these interventions, though, as MCOs play a role, transparency and contractual expectations provide reason to believe this is possible. In addition to populations, Ohio’s medical industry interests are a significant player in the budget. For hospitals and pharmacy, where MCOs have an influence, the state is able to effectuate clear reforms coordinating resources to make changes. While Ohio is ranked low in terms of value, this sort of contractual flexibility has the potential to improve outcomes in an ongoing fashion. Nursing facilities, on the other hand, which are not subject to the same flexibility or contractual obligations of a managed care model, will be cut to accommodate the JMOC target. While it remains to be seen if nursing facilities are able restore these cuts, any additional investment for these providers should be focused on improving a track record of low quality and high expense. While it remains to be seen if nursing facilities are able restore these cuts, any additional investment for these providers should be focused on improving a track record of low quality and high expense. Source: LSC Redbook Analysis of the Executive Budget Proposal, Ohio Department of Developmental Disabilities. In the proposed biennial budget offered by the DeWine administration, the Ohio Department of Developmental Disabilities (ODODD) will see an increase in overall funding from FY 2018 to FY2021 of nearly $660 million. This increase is primarily tied to federal dollars financed through Ohio’s Medicaid program to reimburse for services provided to individuals with developmental disabilities and their families. Key initiatives of the executive budget for ODODD include pay increases for providers, services for multi-system youth and enhanced funding for early intervention services to address the public health issues of lead poisoning and the opioid crisis. Key initiatives of the executive budget for ODODD include pay increases for providers, services for multi-system youth and enhanced funding for early intervention services to address the public health issues of lead poisoning and the opioid crisis. ODODD proposes to increase the pay for homemaker personal care direct support professionals and on-site, on-call direct support professionals. Homemaker personal care includes services that are intended to maintain an individual’s independence within their home or community and helps the individual meet daily needs. This includes the development of self-advocacy and daily activities such as personal care, self-administration of medication and meal preparation. The increase is done in two stages, but will ultimately represent an increase in the average wage from $11.12/hour to $12.38 totaling a $115.89 million investment in the biennium. For on-site, on-call professionals, which provide the same essential services as homemaker professionals but without the requirement to stay awake during their service, there will be an increase from $6.09/hour to $8.55 totaling $55.29 million during the biennium. In sum, these increases represent $171.18 million, with about 63 percent coming from the federal government ($63.3 million in non-federal share). Homemaker personal care includes services that are intended to maintain an individual’s independence within their home or community and helps the individual meet daily needs. Early Intervention (EI) services are part of a statewide system that provides coordinated services to parents of infants and toddlers with, or who are at risk of having, disabilities or developmental delays. The executive budget recommends a significant increase in EI funding from about $12 million in FY2018 to more than $23.3 million by FY2021. Of this amount, nearly $15.5 million is tied to federal funding allocated through the Community Social Service Block Grant (SSBG). SSBG is received by ODJFS before being distributed to ODODD and the Ohio Department of Mental Health and Addiction Services ODMHAS and has a total value of nearly $27 million. Previously, the EI program was housed within ODH but was transferred to ODODD as a result of HB 483 of the 131st General Assembly. Funds associated with this increase are intended to expand program eligibility to include families at-risk of or facing lead poisoning or a diagnosis of neonatal abstinence syndrome (NAS). Given the relationship between lead exposure and NAS to brain development and behavioral health, this expansion is intended to open up EI services for families to receive service coordination, evaluation, assessment and, where appropriate, direct services. As we have written about, MSY represent a category of children who, due to significant need, are often engaged with multiple human service delivery systems including, but not limited to, Medicaid, corrections, foster care and behavioral health. Pursuant to a legislative committee’s recommendations from the previous General Assembly, investments called for in multiple parts of the executive budget to coordinate services for this population. For ODODD, this investment represents $1 million per year ($2 million for the biennium) which will complement up to $25 million in funding from ODJFS and $20 million from the ODM to target services for children with complex, multi-system needs. With the transition of county boards away from direct service provision, pay increases may help ODODD develop a workforce that can accommodate the needs of the population who receives services from direct support professionals, which is a lower cost option when compared to institutional care. Additional funding for multi-system youth represents a renewed commitment from the General Assembly to work with children with complex needs across multiple departments and Community Solutions will monitor this effort throughout the budget process. The investments in EI seem to be responsive policy concepts to some of the most pressing public health crises facing young children. Since many children who may be at risk for lead poisoning are not accounted for in the school system before the age of 3, and as Ohio’s screening rates are relatively low, these resources could fill a critical void in the case management of lead poisoned children. ODODD should ensure that county agencies and providers responsible for this population are appropriately coordinated and connected to the medical system, managed care and other social supports such as housing. Lastly, the state could take a look at how EI services related to screening could adopt an Adverse Childhood Events screening as many of the contracted providers delivering that service are familiar with the tool. ODMHAS is responsible for providing oversight and support of the statewide prevention, treatment and recovery system for Ohioans living with mental illness and/or substance use disorders (SUD). ODMHAS operates six regional psychiatric hospitals and oversees 51 community behavioral health boards that fund and coordinate services across all 88 Ohio counties. Naturally, many of the proposed investments stemming from the RecoveryOhio recommendations fall within the ODMHAS budget. To fund these initiatives, ODMHAS requested an increase in state GRF dollars of 4.6 percent in FY 2020 and an additional 3.3 percent in FY 2021. GRF dollars make up just more than half (52 percent) of ODMHAS’ budget request over the biennium. The department requested substantial increases in appropriations from non-GRF state and federal funding sources, primarily due to large, one-time funding initiatives and federal grant funding expected in FY 2020. In FY 2021, ODMHAS’ all-funds budget shrinks due to considerable reductions in expected federal and non-GRF state revenues, though the GRF share of the budget will continue to grow. Source: LSC Redbook Analysis of the Executive Budget Proposal, ODMHAS. Hospital services: funding for Ohio’s six regional state psychiatric hospitals that serve civil and forensic patients in need of inpatient psychiatric treatment. Community and recovery services: funding distributed primarily to community behavioral health boards for local treatment and recovery services providers. Pharmacy services: funding for the Office of Pharmacy Services, which purchases and dispenses wholesale pharmaceuticals and medical supplies for certain state and local agencies. Prevention services: funding for services to prevent drug, alcohol and gambling addictions. Program management: funding for ODMHAS central office administration and technical support. Debt service: funding for debt service payments on bonds for long-term capital projects. The following tables report the amount of funds distributed across each of these programmatic areas for the current fiscal year and the upcoming biennium under the executive budget proposal. For simplicity, program management and debt service are merged into one category. A substantial portion of ODMHAS’ budget is consumed by the Ohio’s six regional psychiatric state hospitals. The department estimates it will spend one-third (33 percent) of its total funding on hospital services over the 2020-2021 biennium, including more than half (52 percent) of its GRF funding. Community and Recovery Services represent the largest portion of ODMHAS’ all-funds budget (42 percent) and nearly a third of its proposed GRF spending (32 percent) in the upcoming biennium. This is also the area where the department is proposing the largest investment of new dollars, a total increase of $60 million over the biennium including $24.7 million from GRF. Prevention services is the category with the largest proposed percentage increase from FY 2019 to FY 2020 in the all-funds budget, but prevention still represents a small portion of ODMHAS’ overall budget (5.8 percent of all funds and 1.4 percent of GRF over the biennium). There are virtually no new GRF investments in prevention services in the executive budget. However, some line-items within the community and recovery services category may also be spent on prevention initiatives. DeWine’s budget proposal provides a vehicle for the administration’s first steps to enact many of the initiatives recommended by the RecoveryOhio Advisory Council. Descriptions of each of these major budget proposals are provided below, starting with those housed in the ODMHAS budget. The executive budget proposes increasing the Continuum of Care Services line-item (ALI 336421) by 7.8 percent, or $12 million over the biennium, primarily to expand the Ohio Sobriety, Treatment and Reducing Trauma (OhioSTART) program. This program brings together child protective services, peer mentors, courts and behavioral health providers to provide targeted intervention services to parents with substance use disorders, as well as counseling support for children who have experienced trauma stemming from a parent’s addiction. OhioSTART currently serves 34 Ohio counties as part of a pilot program launched by DeWine while he served as Attorney General. While funding for the pilot counties came primarily from federal Victim of Crimes Act (VOCA) grants, the executive budget requests GRF dollars from the Continuum of Care Services line-item to expand the program to serve 30 additional counties over the biennium. The executive budget invests $2.5 million in new GRF funding each fiscal year in the specialized docket support line item (ALI 336425)—a 50 percent increase from FY 2019 funding. This new money allows ODMHAS to launch 30 new specialized court dockets over the biennium. Specialized dockets, including drug courts, help divert defendants with mental illness or substance use disorders into treatment rather than to jail or prison, and help children remain in their homes. ODMHAS reports that more than 6,300 adults and children received services through more than 130 specialized dockets that received funding from ODMHAS in FY 2018. ODMHAS reports that more than 6,300 adults and children received services through more than 130 specialized dockets that received funding from ODMHAS in FY 2018. At the same time, the executive budget reduces the amount of funding earmarked for drug courts to provide substance use disorder treatment and recovery supports. In FY 2019, $8 million in GRF dollars were earmarked within the criminal justice services line-item (ALI 336422) for this purpose. The executive budget reduces this amount to $6 million per year in FY 2020-2021. In testimony before the House Finance Subcommittee on Health and Human Services, ODMHAS Director Lori Criss told the committee that this reduction was not a funding cut but a “rightsizing,” noting that funds from previous budgets had gone unspent within this earmark. The executive budget continues funding that was created in the current state budget for mental health crisis stabilization centers and substance abuse stabilization centers. These centers were required by the last state budget bill (House Bill 49, 132nd General Assembly) to be created in each of the state’s six psychiatric hospital regions. The proposed budget would provide flat funding at $1.5 million in each fiscal year for mental health crisis centers and $6 million per fiscal year for substance abuse stabilization centers. The proposed budget would provide flat funding at $1.5 million in each fiscal year for mental health crisis centers and $6 million per fiscal year for substance abuse stabilization centers. The administration proposed a substantial increase to the ADAMHS boards line-item (ALI 336643), which distributes funding to county Alcohol, Drug Addiction and Mental Health Services (ADAMHS) boards. This line-item was funded at $5 million in FY 2019 and would be increased to $21 million in FY 2020 and $11 million in 2021. All of the $22 million in new funding over the biennium is fully earmarked within this line-item to expand crisis services infrastructure and provide flexible resources for local crisis stabilization and crisis prevention efforts. The budget bill also reduces the amount of unrestricted funds distributed to each ADAMHS Board. In FY 2019, $5 million was allocated from the ADAMHS boards line-item in combination with $2 million from the continuum of care services line-item (336421) to distribute funds to the ADAMHS boards. Each board received $75,000 per county under its jurisdiction, and remaining funds from the line-items were allocated based on the average number of opioid overdose deaths in each board’s jurisdiction. The proposed budget eliminates the $2 million annual earmark from the continuum of care services line-item and reduces the base allocation for ADAMHS boards from $75,000 to $50,000 per county. The budget language also broadens the language that guides the distribution of remaining line-item funds, specifying that funds will be distributed in proportion with the most recent drug overdose death information available rather than opioid-specific overdose deaths. Funding for the ADAMHS Board line-item comes from a dedicated purpose fund group that was newly created in the current state budget (FY 2018-2019) using funds that otherwise would have been distributed to municipal governments through the local government fund. The statewide treatment and prevention line-item (ALI 336623) contains the single largest proposed dollar amount increase of any state-funded line-item in the ODMHAS budget from FY 2019 to FY 2020, jumping from $15.6 million to $51.6 million. This line-item is funded by dedicated purpose funds generated by driver’s license reinstatement fees and liquor permit renewal fees. The large injection of new funds in FY 2020 is earmarked for one-time investments, including $18 million for the purchase of evidence-based K-12 prevention curricula and provision of quality prevention services; $13 million to launch a statewide multimedia prevention, treatment and stigma reduction campaign; and $5 million to expand training in mental health first aid as well as de-escalation techniques for law enforcement. The line-item drops down to $21.6 million in FY 2021, but includes an additional $5 million above FY 2019 levels earmarked for continuation of the multimedia campaign. 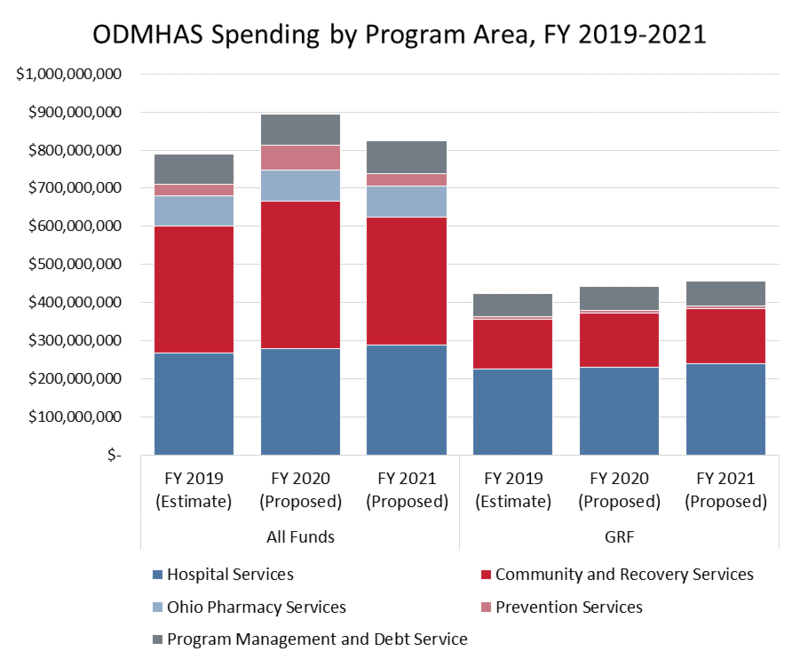 ODMHAS expects to see an increase of more than $30 million in federal funding from FY 2019 to FY 2020, but total federal funds are expected to fall in FY 2021 below FY 2019 levels. The department’s largest sources of ongoing federal funding come from the Substance Abuse Block Grant (SABG), the Mental Health Block Grant (MHBG) and the Social Services Block Grant (SSBG). The SABG and SSBG line-items (ALIs 336618 and 336612) are flat funded at $65.9 million per fiscal year and $8.5 million per fiscal year, respectively. The SABG is used to distribute funding to ADAMHS boards for prevention, treatment and recovery supports according to guidelines from the federal Substance Abuse and Mental Health Services Administration. The SSBG funds are allocated to the ADAMHS boards based on poverty rates within each board’s population, and are used for supportive services such as case management, employment, counseling and residential services. The MHBG line-item is expected to grow 29 percent above FY 2019 levels to $22 million in each fiscal year. These funds are distributed to the ADAMHS boards for services, targeting adults with serious mental illnesses and children with serious emotional disturbances. The substantial fluctuation in total federal funds funneled through ODMHAS over the biennium is driven by uneven disbursements of federal opioid response grants each year. The substantial fluctuation in total federal funds funneled through ODMHAS over the biennium is driven by uneven disbursements of federal opioid response grants each year. Ohio began to receive grant funding authorized by the 21st Century Cures Act in 2017 and is expected to receive around $33 million in Cures funds each year of the upcoming biennium—up from $26.4 million in FY 2019. Ohio will also receive substantial funding from the State Opioid Response (SOR) Grant, which is a two-year grant awarded in FYs 2019 and 2020. ODMHAS received $43.2 million in SOR funds in FY 2019 and has requested an appropriation of $59.4 million in FY 2020 and $16 million in FY 2021. A key plank of the RecoveryOhio policy platform is to ensure parity between behavioral health care and physical health care in terms of access and insurance coverage. In testimony before the House Finance Subcommittee on Health and Human Services, the Director of the Ohio Department of Insurance (ODI), Jillian Froment, told legislators that her department will request a $1 million increase in appropriations to increase consumer outreach by launching an educational campaign to help consumers better understand parity requirements in insurance coverage and address areas of noncompliance. The Director of the Ohio Department of Insurance (ODI) told legislators that her department will request a $1 million increase in appropriations to increase consumer outreach. As part of the administration’s focus on prevention efforts, the proposed budget would invest more than half a billion dollars over the biennium to create the Student Wellness and Success Funds (SWSF) initiative. The initiative is funded through earmarks of $250 million in FY 2020 and $300 million in FY 2021 from the Ohio Department of Education’s (ODE) GRF line-item for foundation funding (ALI 200550). These funds would be distributed to school districts in proportion with student poverty concentration to support school-based services that address nonacademic barriers to student success, such as mental health services, mentoring, and family support services. ODE requested $1 million in new funding in each fiscal year to award professional development grants for educational service centers that train teachers and other school personnel in substance abuse, suicide, bullying and other harmful behavior prevention. In addition to the SWSF initiative, ODE requested $1 million in new funding in each fiscal year to award professional development grants for educational service centers that train teachers and other school personnel in substance abuse, suicide, bullying and other harmful behavior prevention. This funding is earmarked in the GRF line-item for Educator Preparation (ALI 200448) and is meant to complement the $18 million in the ODMHAS budget for K-12 prevention education. The Chronic Disease, Injury Prevention and Drug Overdose line-item (ALI 440482) under the Ohio Department of Health’s (ODH) budget provides GRF funding for wide-ranging public health needs, including behavioral health. This line-item is budgeted to see a 119 percent increase from $3.5 million in FY 2019 to $7.7 million in FY 2020 and $7.9 million in FY 2021. ODH plans to use some of this increase to create the Substance Use Disorder Professional Loan Repayment Program, providing repayment of student loans to participating providers in exchange for two years of service in a community-based treatment setting. The administration has stated that the program will serve up to 20 full-time providers at a cost of $750,000 over the biennium. ODH also plans to use $2 million from this line-item over the biennium to expand access to naloxone, the opioid overdose reversal drug, to high-risk counties. An additional $500,000 over the biennium is slotted to create an “opioid collaborative” pilot program to combat the opioid crisis. The Department of Public Safety (DPS) budget creates a new line-item, Recovery Ohio Law Enforcement (ALI 761403) that would provide $19.5 million in new GRF funding over the biennium to hire 16 full-time staff to assist law enforcement drug task forces responding to Ohio’s opioid crisis. The funding would further assist these task forces by creating a “Narcotics Intelligence Center,” strengthening partnerships with local law enforcement, and partnering with the Department of Administrative Services to maintain a uniform records management and data intelligence system. Making substantial investments in upstream prevention efforts, reducing stigma and steering more Ohioans into recovery are rightfully major priorities of this administration’s budget request. As the budget continues to be heard by the House Finance Committee and Subcommittees, we will gain a better picture of the legislature’s appetite to allocate increased general revenue dollars for these purposes. An important concern for ODMHAS is how much of its GRF budget will be consumed by Ohio’s state psychiatric hospitals, which were at 94 percent occupancy as of March 2019. Director Criss told legislators, in the department’s budget hearing, that reforms must be made to court orders for the evaluations of defendants’ competency to stand trial for forensic misdemeanor patients, in order to relieve pressure on the state hospitals. Lawmakers also continue to express concern over how ODMHAS and the ODM will address provider payment issues stemming from Behavioral Health Redesign, signaling that this will remain a pertinent topic as budget deliberations continue. An important concern for ODMHAS is how much of its GRF budget will be consumed by Ohio’s state psychiatric hospitals, which were at 94 percent occupancy as of March 2019. As we noted earlier, DeWine has made children and early childhood a policy priority. The 2020-2021 biennial budget also makes a point of increasing the support systems for individuals on the opposite end of the spectrum, those who are aging. As we have frequently noted in previous reports, the state’s senior population is rapidly changing and growing. In this section of State Budgeting Matters, we will look at several noteworthy items in the Ohio Department of Aging’s proposed budget. The 2020-2021 biennial budget also makes a point of increasing the support systems for individuals on the opposite end of the spectrum, those who are aging. One of the sharpest increases in funding is in the line item 490410, the Long-Term Care Ombudsman’s office. This office is comprised of paid and volunteer staff members who are integral to the safety and security of seniors. As the name suggests, they serve as advocates for seniors, and as an intermediary for providers, residents and their families, to resolve problems and concerns. Long-Term Care Ombudsman offices are located throughout the state; however, the need for senior support services continues to grow. In FY2019, the office received $477,877. The governor recommended a 286 percent increase to $1,846,979 in FY2020 and an additional 68.5 percent increase to $3,112,901 for FY2021. The Senior Farmer’s Market Nutrition Program is very popular where it is available, with a 95 percent redemption rate and a waiting list of more than 1,900 individuals. 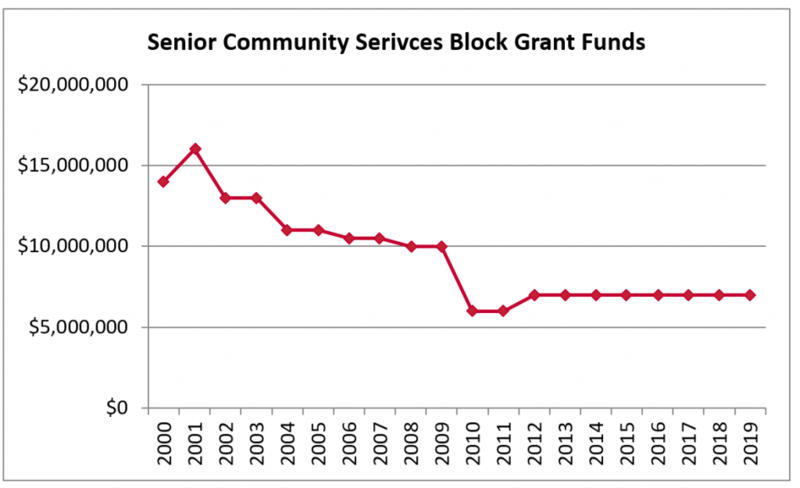 Another area that saw a large increase is senior community services, also known as the Senior Community Services Block Grant (SCSBG), line item 490411. This line item is of particular importance to the Area Agencies on Aging (AAAs), as it is used in a variety of ways to keep seniors in their homes and out of nursing facilities. The funding is used for meals, transportation, personal care and caregiver support, among other things. More specifically, according to testimony by Ursel McElroy, the ODA Director, the statewide aging network of AAAs provides more than 5.8 million home-delivered meals and 1.8 million congregate meals annually. In FY2019, the GRF contribution in the state budget was $6,894,266. Governor DeWine’s office proposed an increase to $8,152,696 for FY2020 and $8,144,480 for FY2021. According to an analysis by the LSC, the increased funding will be used for the expansion of the Senior Farmer’s Market Nutrition Program, which is currently in place in 45 counties in the state. According to testimony from McElroy, the program is very popular where it is available, with a 95 percent redemption rate and a waiting list of more than 1,900 individuals. Much of the money will be used to expand the program to all 88 of Ohio’s counties. ODA proposed a two-year rollout to provide startup funding to counties that do not currently have the program, as well as using rollout funding to scale-up existing programs to meet the demand across the state. Additionally, the increased funds can be used to tailor to the specific needs of local seniors in each AAA district. While the increase is welcome to some, it is still below the $10 million per year, which was the funding level before the recession. The budget process will come to a close in the House by early May. The budget process will come to a close in the House by early May. Finance subcommittees focused on specific areas of the budget wrapped up their work last week and will make recommendations on changes to House Bill 166 before it moves back to the full House Finance committee for an eventual vote out of the committee process and onto the floor of the Ohio House of Representatives. The Ohio Senate will begin informal budget hearings the week of April 22, prior to the House passage of the budget, due to the short time frame to work through the budget before the June 30 deadline for the governor’s signature. Community Solutions will continue to provide resources on the budget as the legislature moves through this process. “Ohio Department of Medicaid Redbook.” Legislative Service Commission. Accessed April 3, 2019. https://www.lsc.ohio.gov/documents/budget/133/MainOperating/redbook/MCD.PDF. “Recommendations of the Governor’s Advisory Committee on Home Visitation.” March 2019. Accessed April 3, 2019. https://governor.ohio.gov/wps/wcm/connect/gov/3a3d1e69-6e43-4655-9578-22ff27407f7b/Governor Advisory Committee Visitation Report.pdf?MOD=AJPERES&CONVERT_TO=url&CACHEID=ROOTWORKSPACE.Z18_M1HGGIK0N0JO00QO9DDDDM3000-3a3d1e69-6e43-4655-9578-22ff27407f7b-mBuJ3dU. “State Fiscal Years 2020-2021 for Biennium Growth Rate Projections.” December 3, 2018. Accessed April 3, 2019. http://jmoc.state.oh.us/assets/meetings/OptumasReport.pdf. “Ohio’s Medicaid Managed Care Pharmacy Services: Auditor of State Report.” August 16, 2018. Accessed April 4, 2019. https://audits.ohioauditor.gov/Reports/AuditReports/2018/Medicaid_Pharmacy_Services_2018_Franklin.pdf. Aly, Reem, JD, MHA, and Amy Bush Stevens, MSW, MPH. “2019 Health Value Dashboard.” April 2019. Accessed April 3, 2019. https://www.healthpolicyohio.org/wp-content/uploads/2019/04/2019__HealthValueDashboard.pdf. Wicklund, Eric. “Schools Turn to Telemedicine to Tackle Student Depression, Violence.” MHealthIntelligence. April 02, 2018. Accessed April 04, 2019. https://mhealthintelligence.com/news/schools-turn-to-telemedicine-to-tackle-student-depression-violence. Anthes, Loren, MBA. “Managed Care Organizations and Medicaid Performance.” The Center for Community Solutions. July 17, 2018. Accessed April 04, 2019. https://www.communitysolutions.com/managed-care-ohio-medicaid/. Caniglia, John, and Jo Ellen Corrigan. “Ohio Nursing Homes among the Nation’s Lowest Rated in Quality of Care: A Critical Choice.” March 19, 2017. Accessed April 04, 2019. https://www.cleveland.com/metro/2017/03/ohio_nursing_homes_among_the_nations_lowest_rated_in_quality_of_care_a_critical_choice.html. “Individuals & Families Homepage.” Service Definitions. Accessed April 03, 2019. http://dodd.ohio.gov/Medicaid/Pages/Service-Definitions-.aspx. House Bill 483. The Ohio Legislature. Accessed April 03, 2019. https://www.legislature.ohio.gov/legislation/legislation-votes?id=GA131-HB-483. Nelson, Lisa. “Lead Poisoning and the Children of Cuyahoga County.” August 03, 2016. Accessed April 03, 2019. https://www.clevelandfed.org/newsroom-and-events/publications/community-development-briefs/db-20160803-lead-poisoning.aspx. Channing-Tenenbaum, Gayle. “Multi-system Youth.” The Center for Community Solutions. March 22, 2019. Accessed April 03, 2019. https://www.communitysolutions.com/multi-system-youth/. Lusheck, Brie. “Trauma, Toxic Stress and the Impact: Defining Adverse Childhood Experiences.” The Center for Community Solutions. January 7, 2019. Accessed April 03, 2019. https://www.communitysolutions.com/research/trauma-toxic-stress-impact-defining-adverse-childhood-experiences/. Ohio Department of Aging, https://aging.ohio.gov/Ombudsman (accessed April 9, 2019). Ohio Association of Area Agencies on Aging, “Invest in Ohio’s Seniors,” http://ohioaging.org/wp-content/uploads/SCSBG-fact-sheet-with-charts-2.0-maps-final.pdf (accessed April 9, 2019). Ryan Sherrock, “Redbook: LBO Analysis of Executive Budget Proposal,” Ohio Department of Aging, March 2019, https://www.lsc.ohio.gov/documents/budget/133/MainOperating/redbook/AGE.PDF (accessed April 9, 2019).